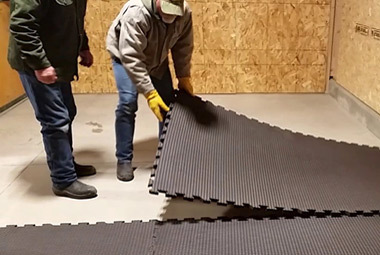 Greenbroke Stall Mat Rental will provide excellent service in meeting your stall mat rental needs. All mats and stalls are thoroughly sanitized before every show, with the health of your horses in mind. Our mats are high quality, antifungal, antibacterial and nonporous. They are guaranteed not to roll, buckle or curl, causing less stress on your horse’s leg joints and tendons with no loss of hair. They have a diamond surface design to ensure special area stability and traction. Georgia National Fairgrounds in Perry, GA.
Greenbroke Stall Mat Rental uses the highest quality 3/4” interlocking rubber stall mats from Humane Rubber Flooring Solutions and 7/8“ interlocking stall mats from Mighty Lite to protect your horse. We power wash our mats after every use with Santi-T-10, a veterinarian-approved disinfectant for stalls and mats. Stall mats can also be treated with Bitter YUCK! chewing deterrent. Avoid damaged mat charges by reducing your horse’s desire to chew on the stall mats. Bitter YUCK! is water-based, and unlike other, alcohol-based products, it will not cause stinging. Greenbroke Stall Mat Rental is pleased to offer our Bedding Services to make your arrival hassle-free. 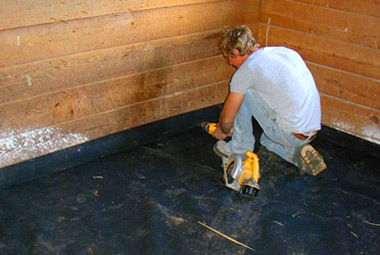 Bedding with Shavings – we will spread three bags of your shavings (unless otherwise requested). If the show does not provide shavings, you must bring your own shavings or you must purchase your shavings through the Georgia National Fairgrounds. Bedding with Pellets – we will spread five to six bags of pellets and moisten to activate expansion. You must provide the pellets. Please Note: You must provide the shavings and/or pellets by bringing your own or purchasing them through the Georgia National Fairgrounds, if they are not provided by the show. We are also proud to announce that all sanitizing services are complimentary. We will not charge our customers for sanitizing the mats or the stalls. Just unload your horse and relax. Call Greenbroke Stall Mat Rental today at (478) 952-6251 for more information about any of our services, or place your order now.